This is so far off the radar of public-policy analysis and apart from the concerns of politicians, pundits, and commentators that few people will take it seriously. Do not be one of them. Your very life may be at stake. For over 40,000 people die on the nation's roadways every year, and you or a loved one might one day join this horrid list. Another benefit of the present book is that it attempts to demonstrate the viability, efficaciousness, and, yes, morality, of the private-enterprise system, addressing a difficult case in point. If we can establish that private property and the profit motive can function even in "hard cases" such as roads, the better we can make the overall case on behalf of free enterprise. The book is organized according to the following plan. 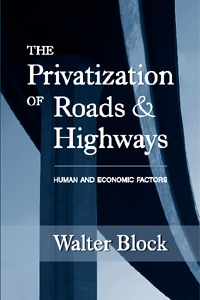 The basic theory of privatization, specifically as applied to roadways, is put forth. The case on behalf of commercializing this sector of the economy is made on the basis of improving road safety and decreasing traffic congestion. Next, this theory is applied to a whole host of related issues, such as automobile insurance, holding parades on public streets, and immigration. Our present institutional arrangements are characterized as socialistic. Then, we assume as a given the goal of privatizing traffic arteries, and instead focus on the very complex process of getting to there from here: what are the problems of transition, how would the authorities move from a situation under their control to market determination, etc.? The next part of the book is given over to dealing with objections to the foregoing. Critiques are launched at several commentators, including Gordon Tullock, Lawrence White, Herbert Mohring, and Robert Poole. This book concludes with an interview conducted with me by several Canadian libertarians.